As a child I was never a lover of sewing, I would happily knit or crochet but did my level best at school to get out of sewing classes. So when a number of years ago I had a job for a sewing machine I decided to buy a basic machine as I never envisaged it would get much use. Its first job was to stitch the backing onto a cross stitch blanket I made for Fifi when she was born, At that point the machine went back into the box and into the loft, It made the odd appearance over the years, a hem here a minor repair there and sewing the backing onto Bob's cross stitch blanket when he was born. 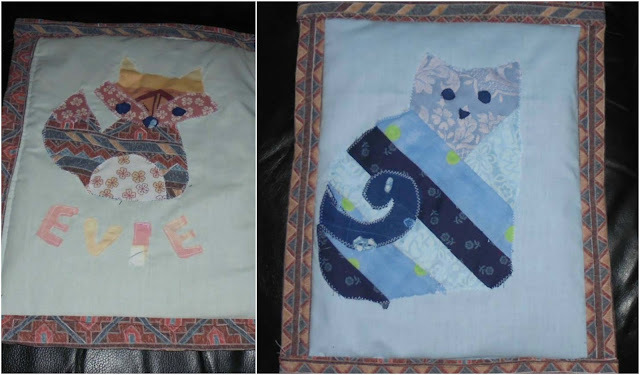 So last year when I dug it out of the loft to finish off Minky and Dinky's cross stitch blankets I decided it was not going back to the loft as I was going to use it, properly use it. 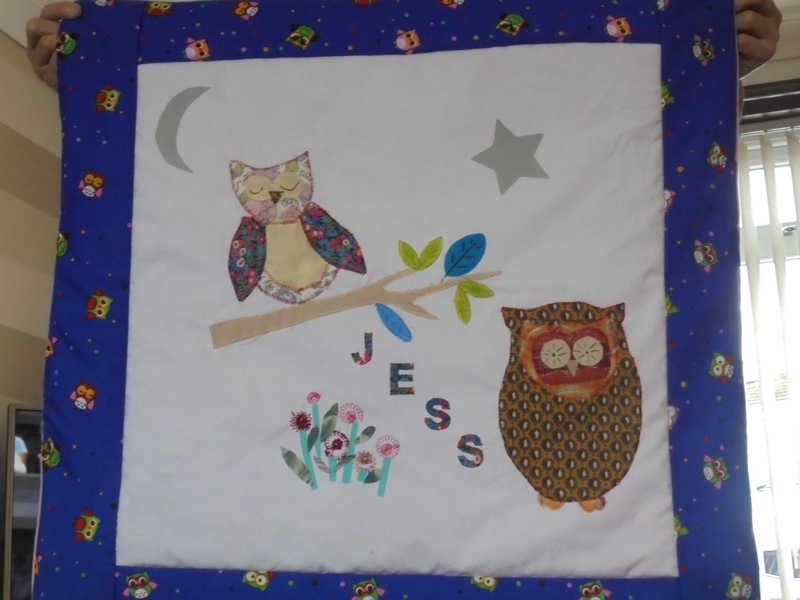 At the start of the year I begun messing around with patchwork and applique. Nothing of any particular standard to begin with but fun and interesting. four nine square's made into a larger piece of work. 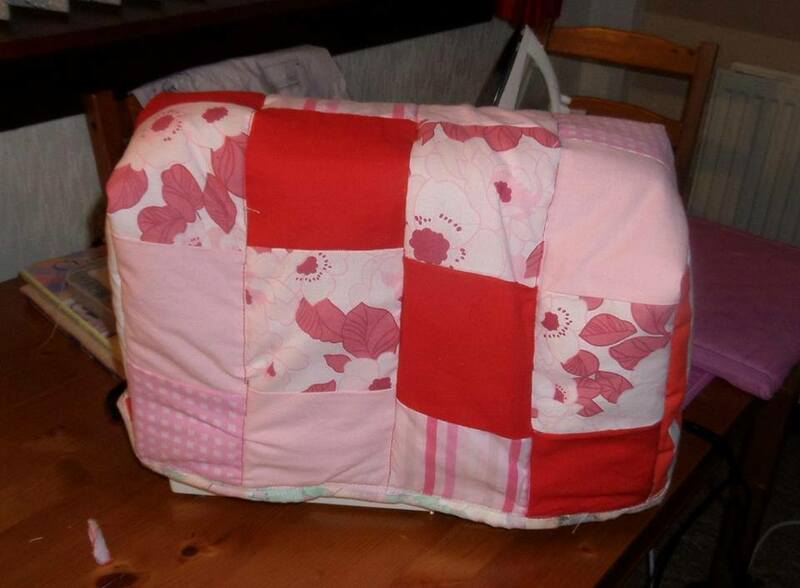 My next piece was a useful item, a cover for my sewing machine. 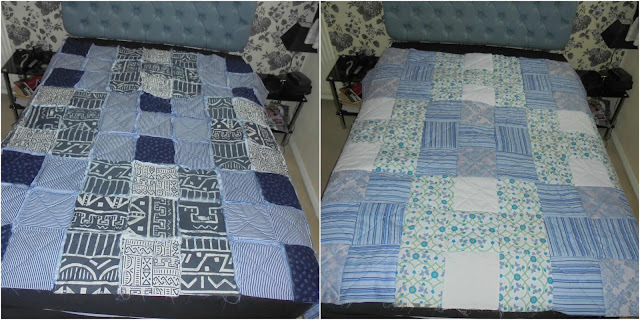 My next project was more ambitious, too ambitious probably, and whilst I really liked the top I could not manage to get the back quilted in the way I had envisioned. It brought together a lot of new to me techniques. I was going to throw it away. But my SIL gave it a home and really likes it, as she says she does not look at the back anyway. I experimented with cathedral windows and various other pieces of work. But having decided to go to smaller pieces for work for a while I made a not so perfect piece of applique for Spud's first birthday, a doll blanket. These seemed to be a hit with friends and people ordered them and I decided to make for the local cash for kids charity. At this point I decided I wanted to try something different. Was finding a lot of ideas on Pinterest that \I wanted to try. Something to add texture and dimension to what I was doing. But as my machine is a fairly basic model some of the ideas were beyond the capabilities. As I do not have the money to spare to buy a more upmarket model I decided to look at adding accessories to the machine I have to make it more versatile. As quilting is something I want to try more off I purchased items to enable me to do this. My first choice was a set of various types of feet. 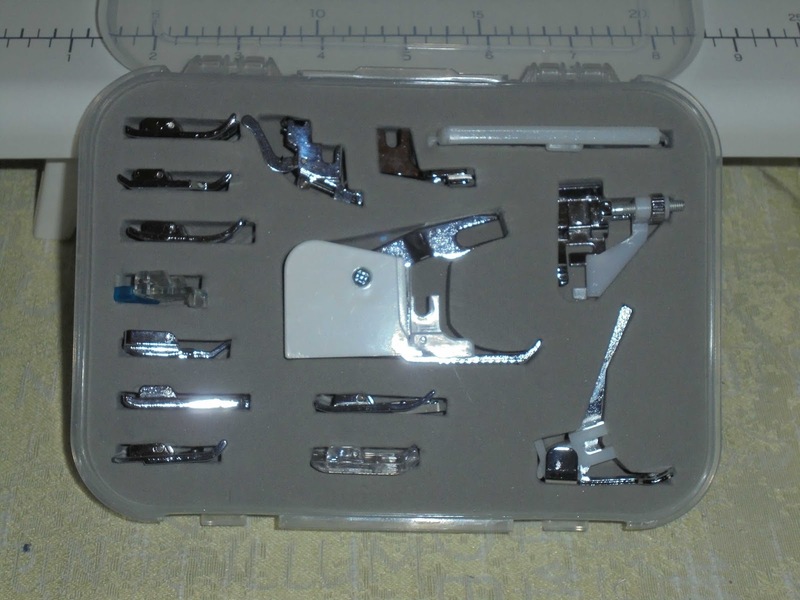 This included a few items I have yet to use but the walking foot and quilting foot are fairly essential for doing quilting. It comes with a leaflet explaining what each foot does and you will find tutorials on youtube to help you grasp the basics of each foot. Next I decided to get an extension table to add on to my machine to make it easier to make larger items. This was used for my first king size scrap quilt I have made. 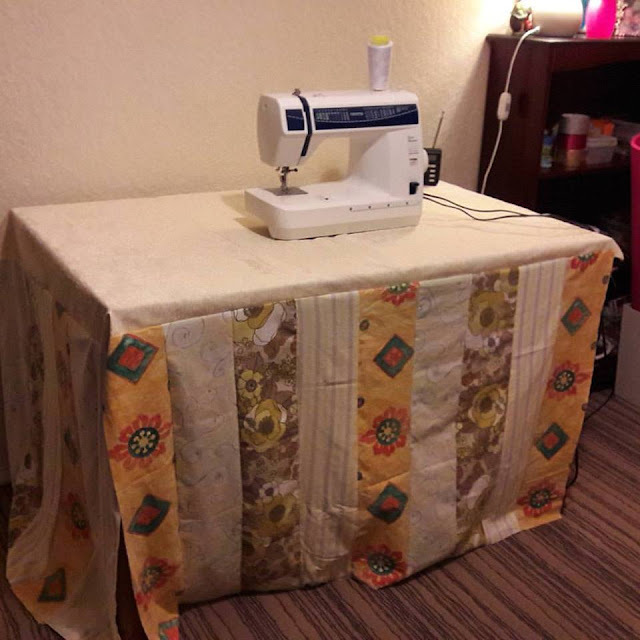 The table enables you to spread the weight more evenly and I find it helps to balance the quilt out and makes the sewing more even. 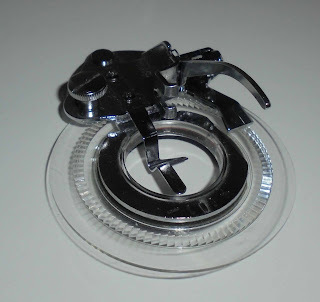 I also looked at a few differing accessories to enhance my quilting. One of these items is a free motion foot. Again you will find youtube videos on how to use them but I have to admit defeat with this one, no matter what I tried I could not get my bottom thread to have any tension, it just looked all lumpy and bumpy. 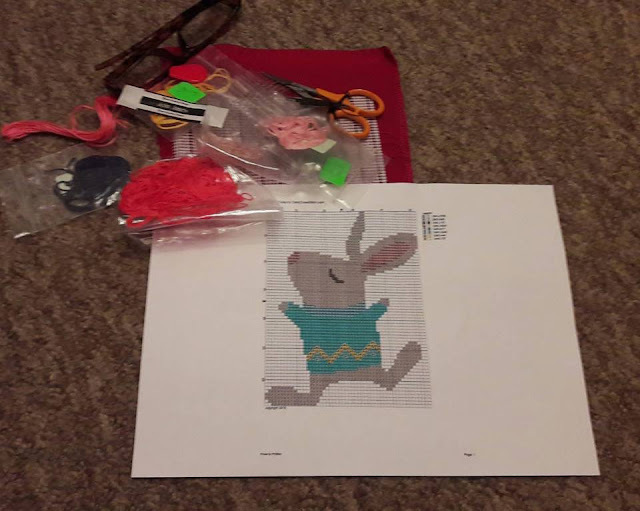 I did try changing my tension and stitch length but no matter what I tried with it I was not happy with the results. The final accessory I added was a flower stitch foot. This is great as it works with the patterns you have built into your machine. Again there are many online tutorials, I had a lot of fun playing with this attachment, trying out the different stitches in different colours. 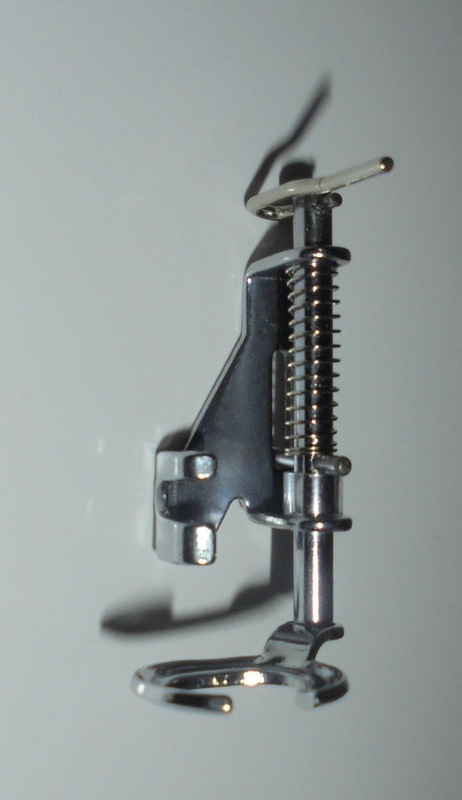 I had to google how to attach the foot to my machine and the first time it took me a while to work it out, I initially found it awkward, but once you get use to it it becomes easy enough. 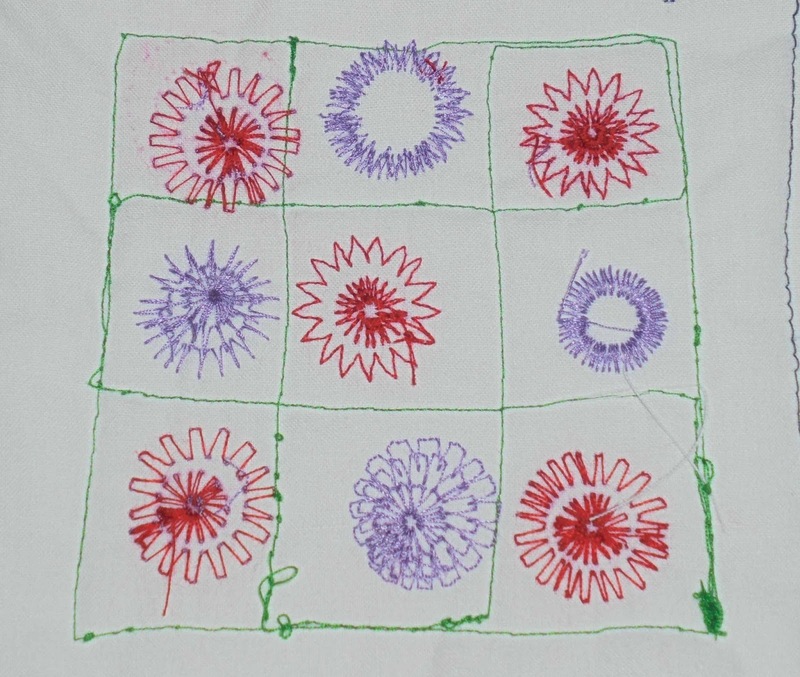 This was my first attempts at using the flowers, I have not finished any of the ends off on here so they look a bit untidy. Different stitches produce different sizes, and the attachment itself makes three different sizes with an easy slide across to change the size. 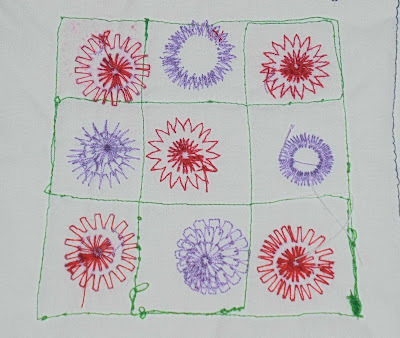 I have used the flowers to enhance a quilt I made for a friends baby. 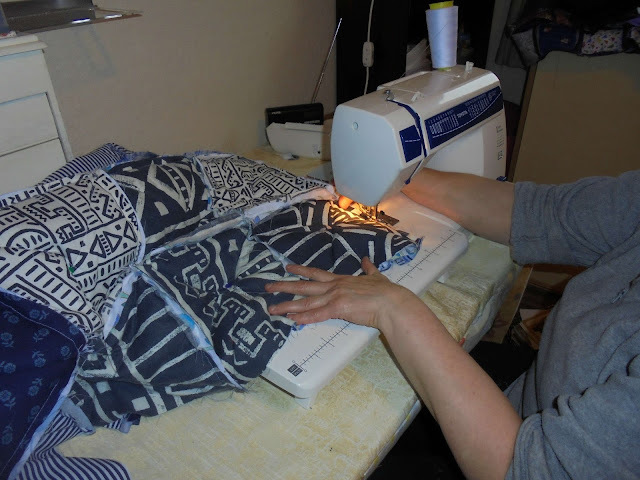 As you can see it is possible to achieve more with the machine you have just by adding accessories, it is not always necessary to buy new if you are on a budget. The flower attachment and the free motion foot was given to me by Toyota, the table and set of feet were purchased by myself. What makes for good Retirement Hot Spots? As we approach another new year, it might be time to start looking for places to retire to and enjoy the rest of your life without any stresses or worries. Here in Britain retirees can look forward to decades of active living, but the big question is – where? With the help of Stagecoach, providers of the Oxford Tube, we discover some of the best hot-spots for retirement in the UK. When we looked to see the trends of where most people put their feet up after a lengthy time working, we could see that the South West had the largest retirement percentage with 19.6% in total. Followed by Wales, with 18.4% and then the East of England with 17.5%. From this, we can see that the top three retirement regions were at the bottom of the country – we wonder why and aim to find out. In fourth place came the North East, with 17.3%. At fifth place the South East region came in with 17.2% of retirees. Closely followed was the East and West Midlands, the East Midlands had 17.1% of retired people whereas the West Midlands had 16.9%. In eighth place came Scotland with around 16.8% of workers retired. From the North West which scored a 16.6% of retirees, we can see a continuous drop in the percentages of retirement hotspots. Yorkshire and The Humber had the same as Scotland, scoring 16.6%. Followed came Northern Ireland with 14.6% of retirees and finally, London with 11.1%. Overall, 16.4% of the UK is retired and longer living is the cause. As 65 was once the retirement age for workers in the UK, at the time, 9.2 million across both England and Wales are over the age of 65 leading to a one in six people over the age of 65 rate. However, the retirement age is on a continuous climb and currently stands at 67. The options are endless when it comes to retirement, from city spaces to rural areas and even seaside locations – there are plenty of hotspots here in Britain that will make your retirement more enjoyable. In our list, we look at what factors contribute into making them a great place for retirement, from activities in the area, to transport link and what the community is like. This is one popular location for people moving swiftly into their retirement as it brings an idyllic vision that most retirees have to life. With Georgian architecture throughout the city, it’s definitely a place with a lot of culture and art attractions to visit. There are a lot of markets that are held in Chichester, allowing the residents to be brought together on a regular basis and endorse that community spirit. With this being in the south, it has great transport links to London and Gatwick, allowing those in retirement to venture in and out of the capital if they want to immerse themselves into a busier culture or to even jet around the globe on their next holiday. If you’re looking to add a bit of colour to your retirement years, there’s no better option that Cromer in Norfolk. With the sandy beaches and light blue ocean reflecting onto the colourful buildings in the town, you’ll wake up with a smile on your face every morning. This town is famous for its long pier which is home to the Pavilion Theatre, the theatre has regular productions highlighting its enthusiastic arts culture with productions from all over the country - allowing retirees to stay in the town rather than venturing out to see the same production they think might only be available in a popular city. This town has tight transport links in and out of Norwich including busses and rail. If you’re looking for a place full of smiling people, Newcastle upon Tyne might be your best bet! Named ‘the happiest place to live in the UK’ by the European Commission, there’s no reason why you wouldn’t be able to love your days of relaxation in this city. Whatever you’re interested in, the chances are that Newcastle has it – from the Baltic Art Centre to over 300 cafes and pubs and even over 92 parks and churches to visit during your time off. If you’re looking to venture out of the city, whether this is abroad or to other places in the country, there’s Newcastle Airport that does both long and short haul flights, as well as Central Station that sits closely in the city for anyone wanting to travel by train. What makes a good retirement? It can sometimes be difficult to know the key ingredients that make up a happy retirement. However, some that we found make complete sense and are achievable by any retiree. One of the main factors is affordability – you want to enjoy your retirement and now have to worry about having spare money to spend after paying your bills. You want to make sure that you can lead your life and not worrying about the cost, that means heading to the theatre every now and then or even treating yourself to an item in one of your favourite stores. Another aspect of retirement that people should look at is the amount of activities that you are able to carry out can also have an impact on how good your retirement becomes – you don’t want to move to a place where much isn’t going on! So, where will you be retiring to? A coastal area with a great view of the beach? A city like Newcastle with all the essentials you need? Or a rural village where you can participate in regular walks in the sun? Hubby had agreed to have Bob a while ago, as DD1 was going into the light switch on as the twins were suppose to be dancing as part of the entertainment. Sadly neither of them wanted to go up and dance. 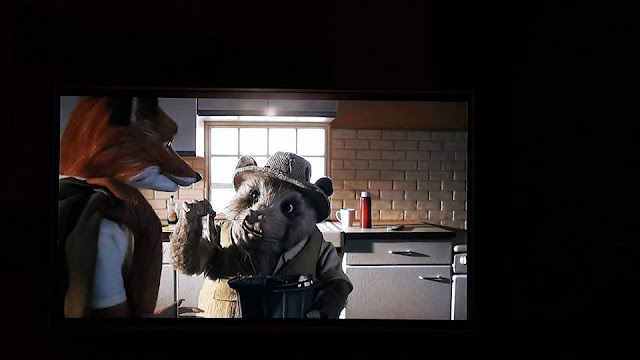 Bob and I sat and watched Fantastic Mr Fox on Netflix while hubby got on with the job of running electricity to his shed. 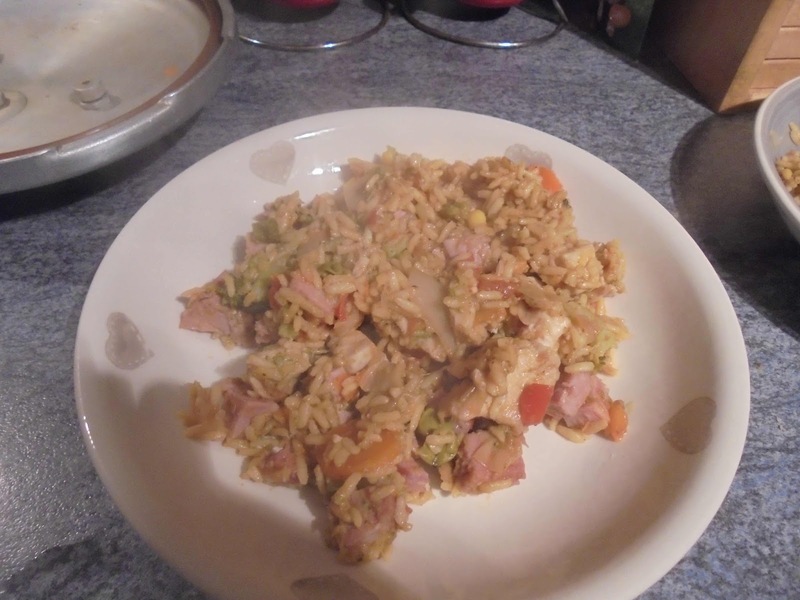 Made some chicken fried rice for tea quick and easy after the gymnastics run. 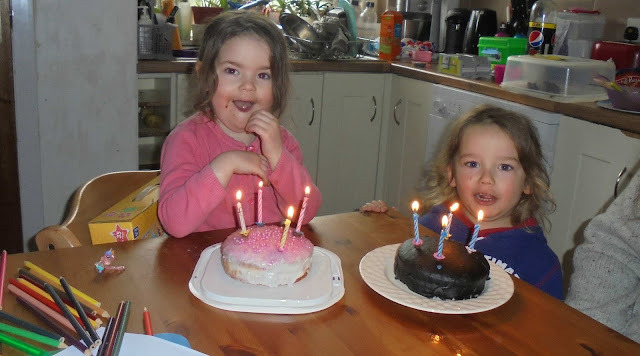 The twins turned four today, Minky got his black cake that he wanted and Dinky got her pink sparkly one. Manged to slowly bit by bit get some sewing done on my latest quilt. 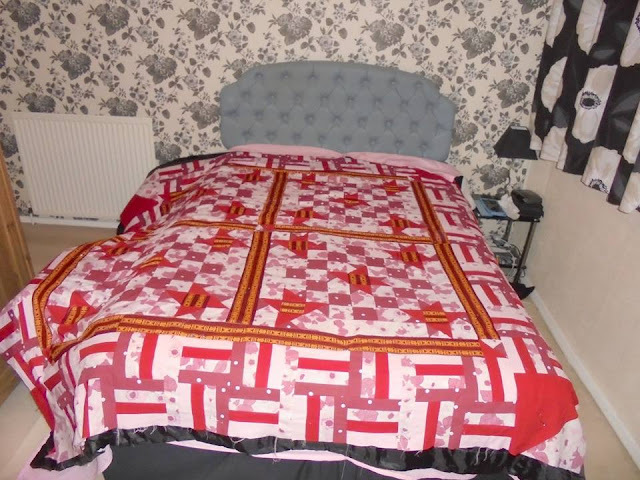 Have decided it is not long enough for a bed so going to add another row on the end to make it longer. The darker side is intended for the top. The extra row may take a while but the quilt is a present for Christmas so got a while to work on it. Off for my first session of physio. She diagnosed an impeached nerve and has given me some exercises to do, three times a day every day for the rest of my life. 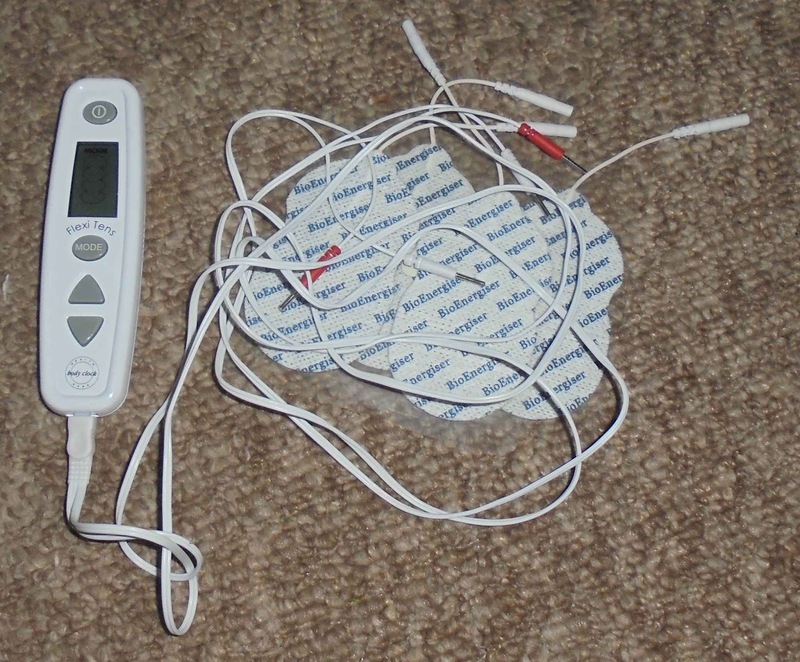 Takes less than a five minutes every day and this can be split up in 15 seconds sessions just to do as and when. To go back in two weeks for another session. DD2 and Ziggy were suppose to be down at the weekend for a few days but could not make it, so they turned up last night instead for a few days. She was putting her baba in the chair ready to be fed. Not sure if it was related to yesterdays physio but my arm was sorer than it has been for a week. Far to painful to move again. 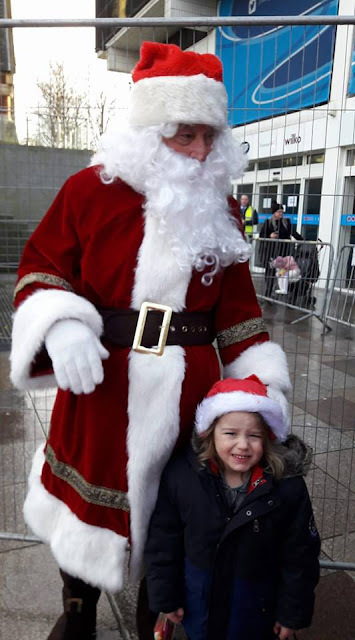 I had a phone call during the week to say I had won a competition to take a child along to "meet and help Santa". So I put Minky's name forward and today I took him along. . The meet was a bit lacking to say the least and there was no helping, it felt like it was rushed and Santa was in a hurry to get away. But he got a present of paw patrol goodies and a bag of sweeties so he was happy with the outcome. We all went but it was cold and miserable so we did not hang around long afterwards, though Dinky was happy she got to meet Paw Patrol after they came off the stage. Project 365 week 45 and 46. No overtime so home to see what hubby has been up to in the shed. Emptying off one into here so he can dismantle and possibly repair the small one. 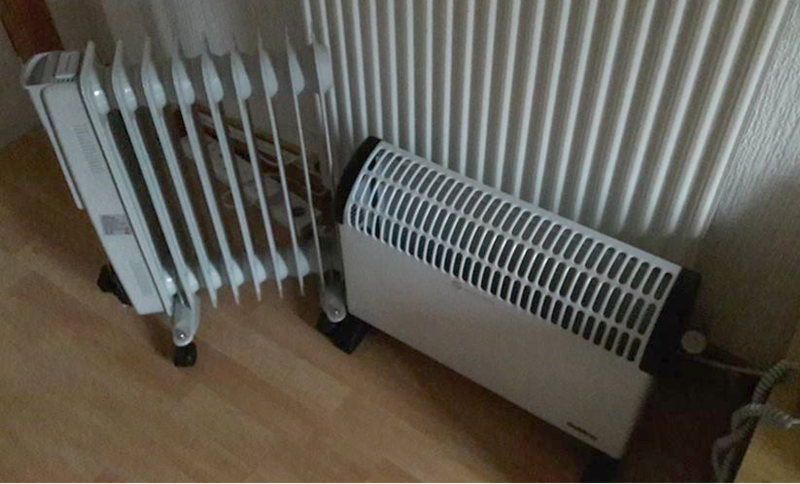 Getting very chilly round here now, time to bring the heaters out of the loft.Electric blanket on the bed as well. 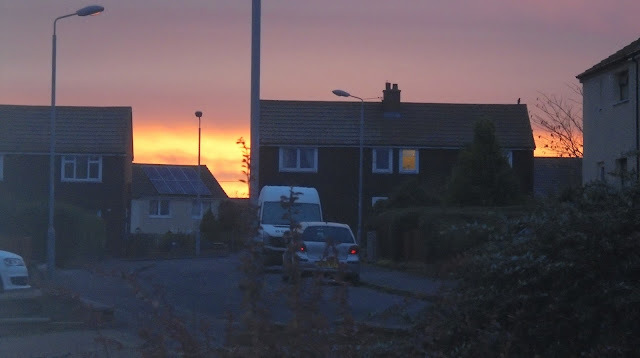 Had a few pretty sun rises this last wee while. Sadly nothing round here to line it up with. 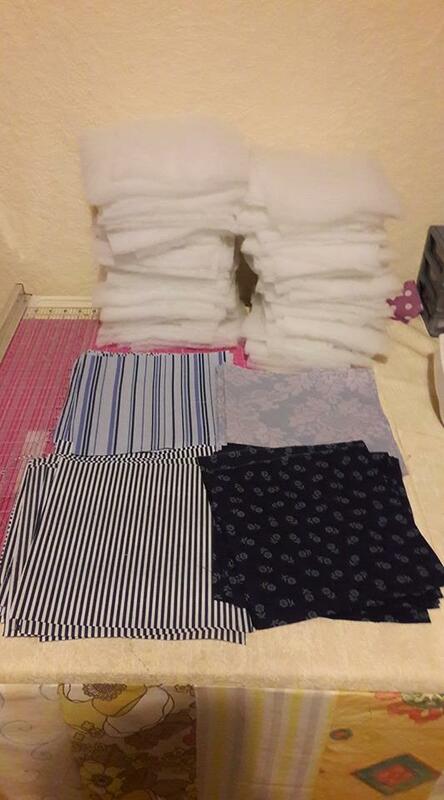 Been cutting out and ironing squares ready for my next project. 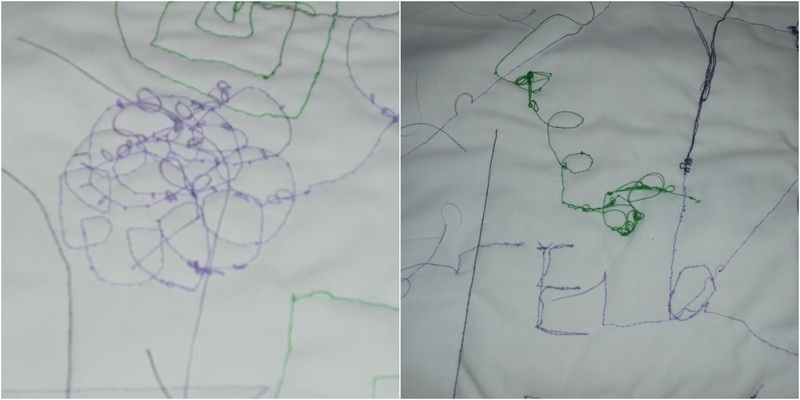 Easier this way as can just randomly go and do small amounts of sewing at a time. Spotted these, being sold in a charity auction so I put a bid in on them and won them. 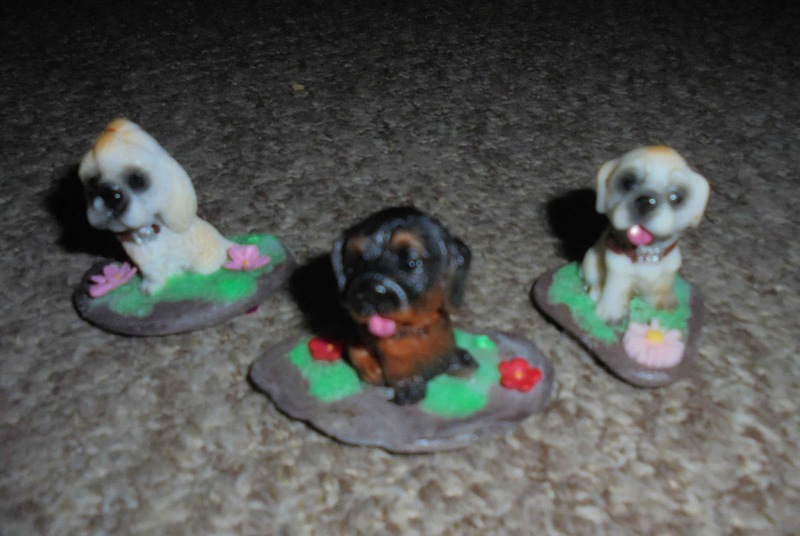 Approx 2 inches tall but I liked them. Had not been feeling well all week, had come to the conclusion I had a urine infection, So tablets from the GP should help. 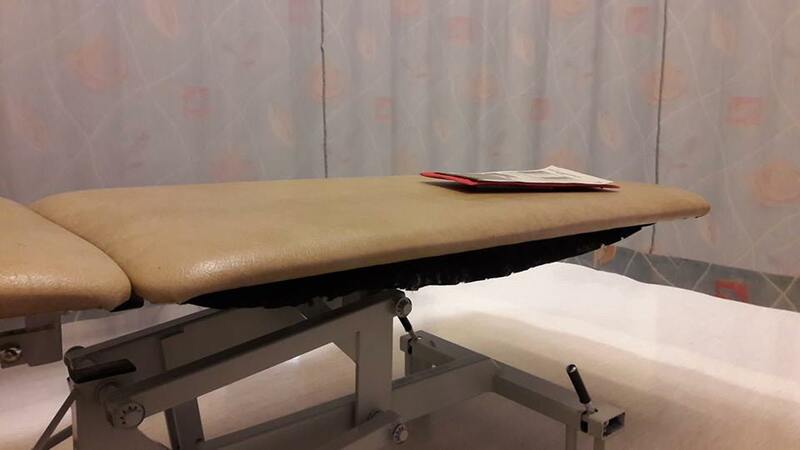 Unfortunately between pains in my stomach and needing to pee every ten or fifteen minutes I was not far from the door apart from going to the GP. I had been doing some sewing earlier in the day, took a break to get something to eat and within an hour my arm was starting to ache. The ache got worse and it got to the stage I could not move my arm, could not lift it, could not do anything with it.The pain got worse and worse so I phoned the local out of hours doctors and eventually got an appointment for 6.45pm. They were running late and time I got seen an hour later to be honest I would have happily let him send me to the morgue if it stopped the pain. He diagnosed a frozen shoulder, strange expression when it feel like somebody is drilling into the top half of arm with six red hot pokers. Even had to get hubby to take my t-shirt off and put it back on for me so he doctor could examine me. Pain was worse than labour. I was given an injection of Pethidine that was suppose to tide me over night and a prescription for 30/500 co-codamol. Injection spaced me put but would not say it relieved the pain. This was as much sewing as I got done. Was hoping to have it finished by next weekend but looking unlikely now. 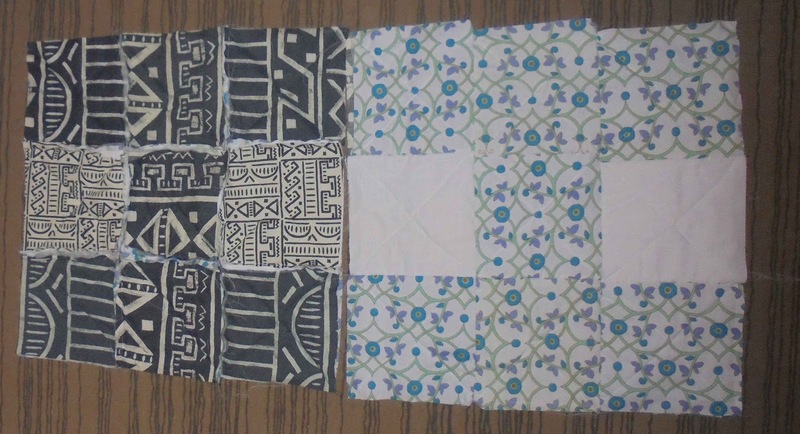 This is the front and back of what will be four squares and another five will compliment it to make a king size quilt. Had no sleep, could not get comfy no matter how I lay. Hubby picked up the prescription for me but they did not really touch the pain either. Fifi was doing a reading in church on behalf of the Cadets and Bob was in the flag party for the Scouts. Not easy to take pictures when you cant use one arm so not the best pictures going. Made a phone call to Occupational Health to get onto a waiting list for physio. Not expecting to be seen before Christmas, but when you work for the NHS you may as well take advantage of the specialists. Had Spud round for a while while DD1 ran hubby to Kilmarnock to pick something up that would not fit in our car. 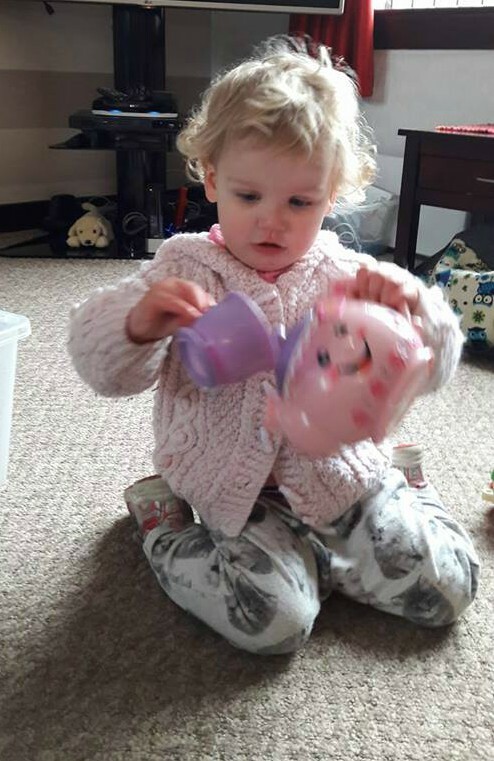 She had a lot of fun playing with the tea pot and cups. Really nice to have her without the twins she is so much calmer without them and nice to get time to play with her as usually Minky demands most of your time and attention. Third sleepless night in a row, so back to GP for something stronger for over night.Having to get hubby to do the driving as I cannot move my arm well enough to reach the steering wheel and too spaced out on pain killers to be able to drive safely. These new tablets were not a good match, upset my stomach, made me really dizzy and spaced out, and I was up half the night vomiting with them. Made me feel truly dreadful. Back to the paracetamol it is. We stopped at the local garage for petrol, hubby has been doing all the driving in the last few days and I have not been in the car, and it never enters his head to put petrol in,. but the garage owner was saying he has had a frozen shoulder in the past and he found a massage helped, very painful but helped to unknot the tension. So I remembered that I had a tens machine that I won many years ago and have never used, so I got it out and have been using four or more times a day since. Hopefully it is doing more good than harm. One of the oldies in the complex I do holiday relief cleaning in went into a nursing home just over a year ago, the family have eventually sold the house. I had been promised some crafting books and some other bits and pieces. 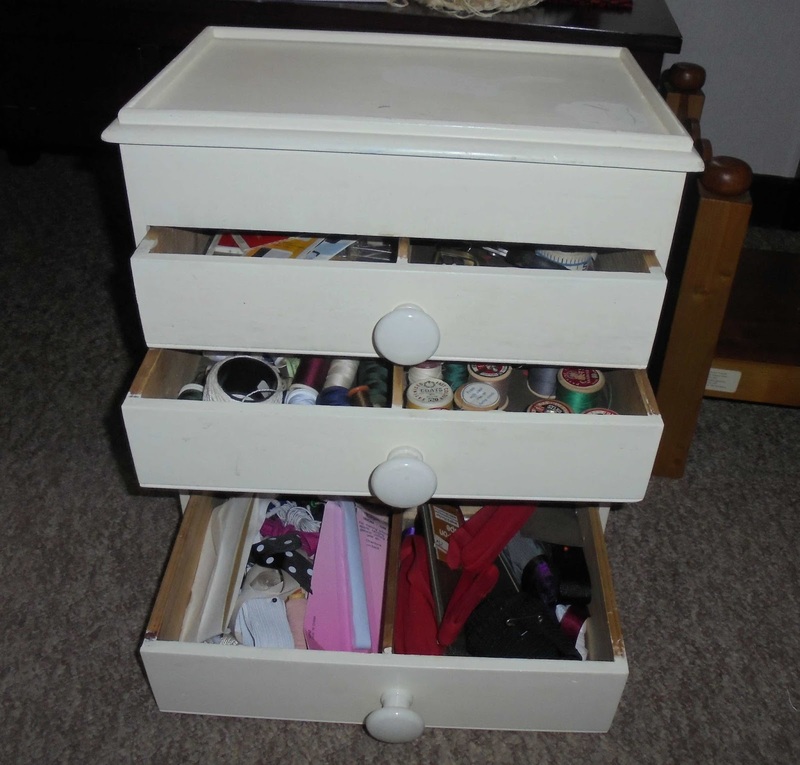 One of the items was the small chest or drawers that had a lot of cottons, a few measuring tapes, few pairs of scissors and a few things I did not recognise I asked about on Facebook. A lot of interesting bits and pieces in the craft book. Got a letter through from the physio dept to phone and make an appointment, So phoned them and they offered me all the outlying areas to choose from, and as they are all pretty much the same distance from me I just asked for the first available appointment, got one for next Thursday. Pleasantly surprised how soon it was nut not complaining. 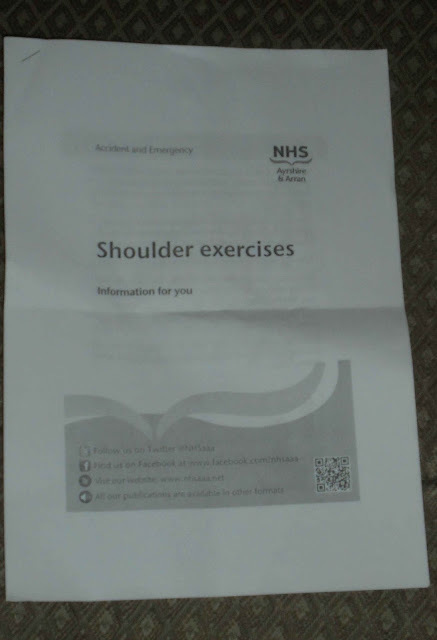 Meanwhile I will use the exercises the GP gave me on Tuesday. Been a long boring week with little sleep and not able to do much. 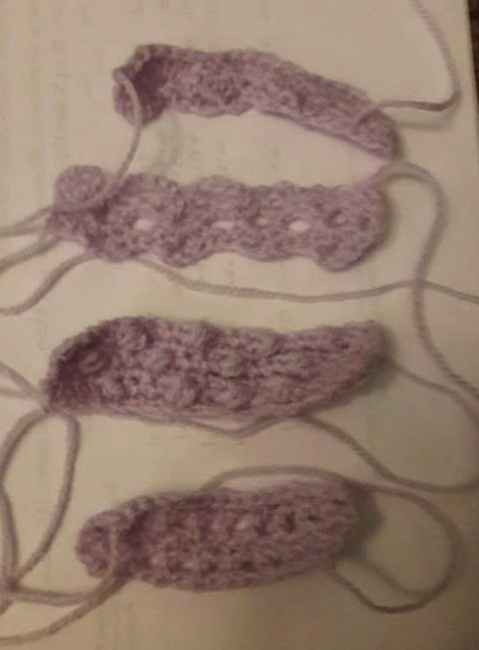 So I manged to try out a few crochet stitches I have not tried before. Not sure that I will ever make anything with the patterns as not sure they would stay square as they get bigger, but may well try it at some point. Fifi turned 15 today. Happy Birthday Fifi. She is turning into a very pleasant young lady who makes us all proud with what she achieves. Did get a picture of her with her cake but her and her two pals had been using face masks before we got there and she still had it on, so you have the cake without Fifi in the picture. 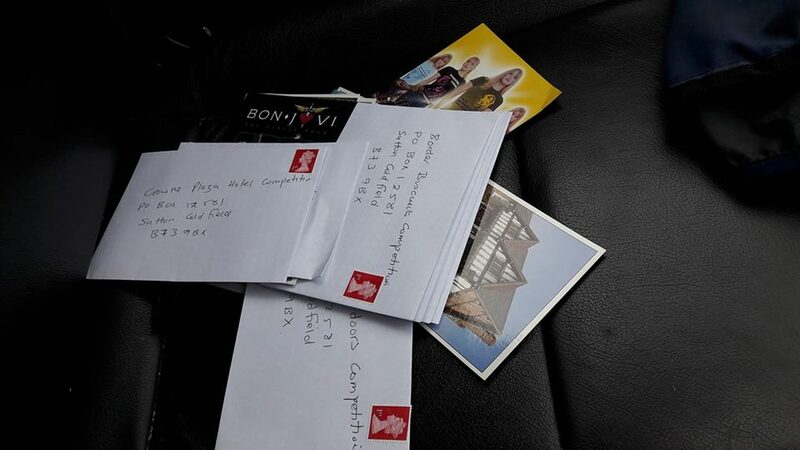 No overtime today unfortunately but decided to use my time wisely and entered a pile of large value postcard entry competitions. Well I won't win if I don't enter. Having said that I posted them on Monday and got three of them back on Tuesday. Guess the postman was not sensible enough to realise the large written address was where it was to go and not the smaller address label added sideways. Finished the table cloth for my sewing table, it is to cover the sides to hide the disaster underneath it. Not the most beautiful material but some of the remains from the start of the year when I was buying odd bedding to practise with. Took Bob to gymnastics. It is a three mile drive from our village to the next one, less than a five minute drive. Just as we drove into the next village Bob tells me he does not feel well, he felt sick. So a quick indicate into the very convenient street on our left and get him out onto the grass, Luckily he was not sick but we turned round and went home again. He was sick a few times in the evening. 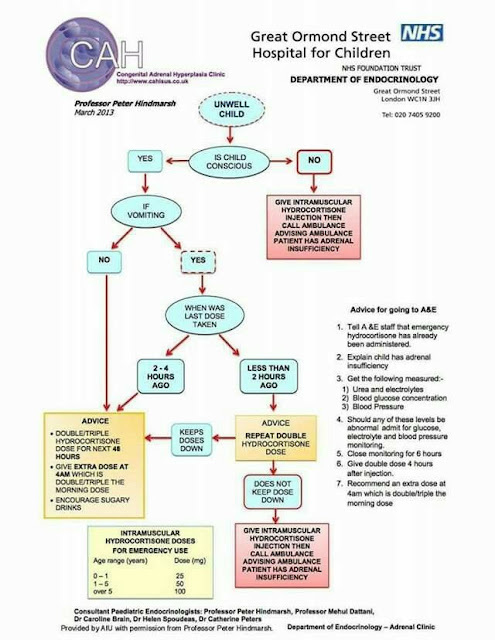 Bob was diagnosed last month with Adrenal Insufficiency (AI) and have to admit to it worrying me. His other medical issues are visible and/or audible and are easier to detect but this one is neither and can prove fatal. If you consider he gets higher priority with this from the ambulance service than a heart attack victim, that will let you know how serious it can be. Vomiting is one of the things that needs to be taken seriously. Poor Fifi also came home from school saying she felt sick and spent the night vomitting as well. Having popped a post onto a AI Facebook page last night asking for the best was to deal with giving the drugs to Bob that is required during this type of illness to save deterioration. Somebody kindly popped this information sheet onto my post. Spotted these in the reduced section of the supermarket, cost 25% of the last packet I bought. 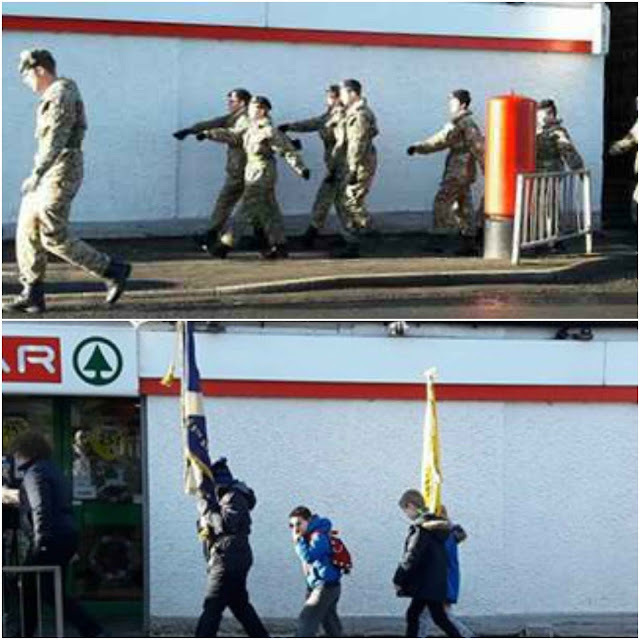 Can't resist a bargain, and it is not as thought they can go off. A visit to the dentist, not my favourite pastime I have to say. But needed a cracked back filling redoing and a chip on a front tooth sorting. The front tooth will be all the years of using my teeth to open packets and cut sellotape etc. Having finished my crocheting I need a portable project on the go for breaks at work and waits at hospitals. Decided as Spud is the only one without a piece of cross stitch work with her name weight and date of birth on it I am going to make her one similar to what the twins got last year. Should be finished for her birthday in March. 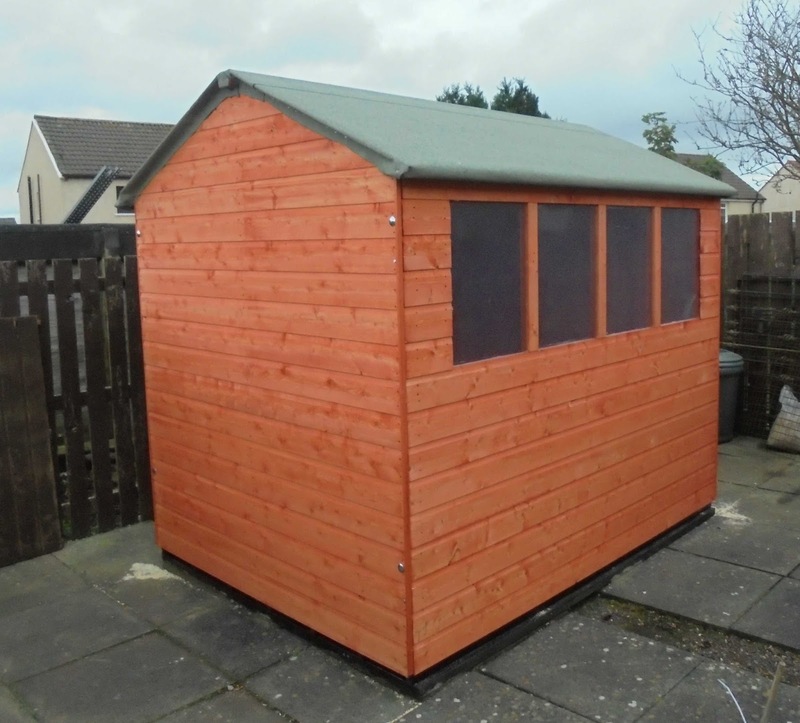 We finally took delivery of our new shed yesterday. Only ( ha ha) took about seven weeks since we ordered it. It came yesterday and luckily today was dry so it is up, windows in and roofing felt on. The finishing touches need doing but should be wind and water tight for the wet and windy weekend we are due. Popped down to watch the three wee ones while DD1 took Bob to his after school activity. DD1 was at the specialist with Bob today for his AI. At least after Monday night gave her an opportunity to ask questions she may not have thought about. 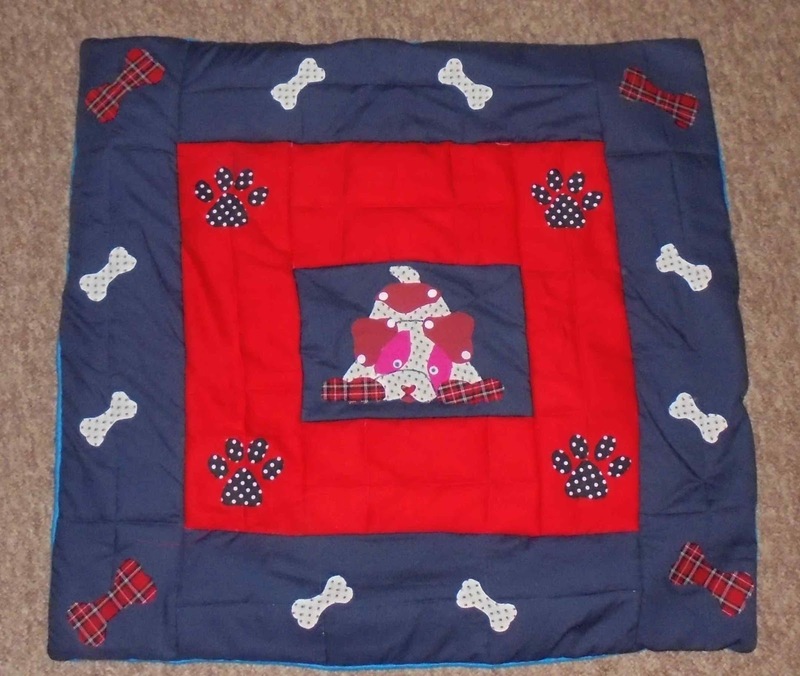 Finished the blanket I have made for a dog rescue site. 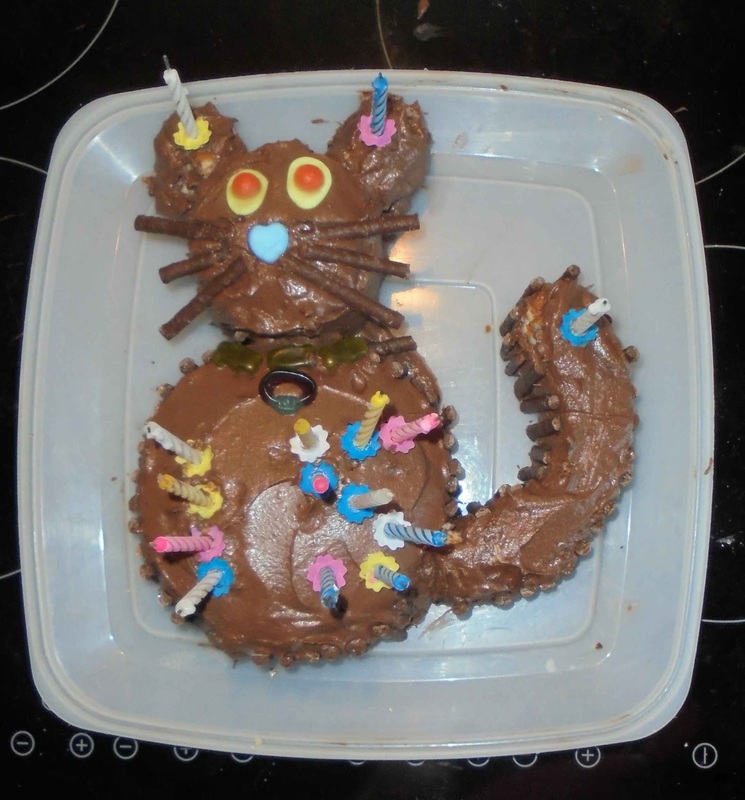 They are always fund raising and the last one I made went for £18 so hoping this will go for good money as well. Happy to personalise it with a name should the winner wish.